Torque Revisited, quakes, plates, volcanic roiling. and storm clash a'coming! Last month we covered the loosening of the Indio/Australian plate, with dual 8+ quakes in Tasmania and Auckland on Dec 23 along the southern boundary, then days later the 9.3 in Sumatra on Dec 26 along the eastern boundary, followed by the extinct Narcondum volcano erupting on Jan 2. This month the N. American plate is loosening, the global Torque Effect twisting eastward. On Feb 8 the live seismos went black in Greenland and Beijing, both on the northern boundary. Days later Kamchatka and Alaskan volcanoes near the boundary erupted. By Feb 17 Norway, also on the boundary, turned black on the seismos. What does this mean? Compression in the Pacific, ripping and dropping in the Atlantic, the plate on the move. In Italy, a water fountain observed to be bubbling clockwise East to West, as the Northern Hemisphere oceans and hurricanes and typhoons do, the coriolis force, suddenly changed direction in early February going counter-clockwise and North to South. Last month we discussed Cayce's prediction that a South Seas breakup would result in a Mediterranean floor heaving and falling, and this occurred. The Zetas explained why the point opposite of a Magma Slam is a point experiencing a Magma Void and sudden Violent Winds from the South, due to the Earth wobble, and what this means for storms in the future. Three Category 4 cyclones passed through the Cook, Solomons, and Fiji islands, in a two week period in early February - Meena, Nancy, and Olaf. This following a record typhoon season in 2004, 11 breaking the previous record of 6, and a record hurricane season in terms of strength and number. Beyond strength and frequency, things will get worse. Gigantic waves, choppy, and huge. What would be the effect of surges and wind coming from different directions, simultaneously, during such storms. What else would cause the children to fall, screaming, at what they saw, writhing on the ground. 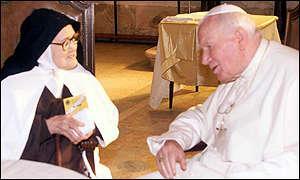 Sister Lucia, dead at 97 at the Carmelite convent in Portugal. Lucia wrote down her vision in 1944, when she feared she was dying, with instructions to make it public by 1960, but in 1957 the Vatican took charge and cloistered Lucia, forbidding her to speak and sealing and refusing to reveal the Third Secret. All 3 Popes since have held with the decision to keep it secret. But the current Pope revealed the contents in 1980 to a German audience. Forgeries in Lucia's name then emerged, asserting anything but the End Times. Conchita of Garabandal, on the day in 1963 when the then Pope passed, remarked 'for sure, now there remain no more than three!'. Three Popes have occurred since, including the current Pope. The end of his reign will supposedly usher in 'the end of the times'. The Catholic world thus held its breath when the 84 year old Pope almost died of throat spasms during a bout with the flu, and the Turk who tried to kill him called on him to admit the world has come to an end. A water distillation technique recently added to the Troubled Times Food section, producing a galon of distilled water every 2.5 hours, highly portable, simple construction any handyman with a welders torch could construct, and produces hot water for washing in the top pot as an added benefit. The Yurt, used by the Mongols sufficient against the bitter winter cold there, highly portable, made from sticks and rope and canvas or felt or plastic sheeting. Photos from the Pacific Yurt site showing Mongol use at left, and modern versions at right. The Teepee, used on the plains by Native Americans, requires a dozen poles, a rope, and a wrap of cloth or leather or plastic sheeting. As with the Yurt, portable, smoke goes out the top. In areas of limited rain, the Adobe requires only sunshine, water, straw, sand, clay soil and wood poles for roof bracing. Troubled Times has a recipe. The houseboat requires only floatation devices such as inner tubes or even air filled pastic bottles, and a raft. Protect the floatation gear with a buffer if encountering rocks or debris along shorelines. Move with the shifting coastline. During the monthly updates we have shown how Edgar Cayce, the Bible, the Oashpe, ancient Babylonian pictograms and Paul Solomon, Plato and Islam, the Kolbrin parallel Bible, the Book of Enoch all address past pole shifts and the one facing us, from the sinking of Atlantis and the Flood, to the polarizing of good and evil as the end draws near, to what to expect as the red dust falls and mountains move during Armageddon. Another classic is the prophecies of Mother Shipton, well known in Yorkshire in the 1500's as a prognosticator and powerful witch. Her prophecies address submarines and airplanes, the horseless carriage, radio and phone communications, and world wars estimated to start around 1926, after which she predicts a fiery dragon in the sky for 6 horrific days, massive flood tides and earthquakes, high death rate, new land rising from the sea, and high tech assistance from interactive living with friendly aliens. A fiery dragon will cross the sky six times before this earth shall die. Mankind will tremble and frightened be for the sixth heralds in this prophecy. For seven days and seven nights man will watch this awesome sight. The tides will rise beyond their ken to bite away the shores and then the mountains will begin to roar and earthquakes split the plain to shore. Not every soul on Earth will die as the Dragons tail goes sweeping by. Not every land on earth will sink but these will wallow in stench and stink of rotting bodies of beast and man, of vegetation crisped on land. But the land that rises from the sea will be dry and clean and soft and free of mankinds dirt and therefore be the source of man´s new dynasty. And those that live will ever fear the dragons tail for many year. But time erases memory, you think it strange. But it will be. And before the race is built anew, a silver serpent comes to view. And spew out men of like unknown to mingle with the earth now grown.